Lesley Fitzpatrick and Maggie Thompson are the co-founders of the History Book Group in San Diego, CA. They join us to talk about their approach to history, and offer up some great advice and selections. BookBrowse interviews Lesley Fitzpatrick and Maggie Thompson are the co-founders of the History Book Group in San Diego, CA. They join us to talk about their approach to history, and offer up some great advice and selections. about all aspects of their book club. We're a spinoff from another group at the book store where we meet. We (Lesley and Maggie) belonged to a nonfiction group at The Book Works (an independent bookstore just north of San Diego, in Del Mar) for about 2 years. As the book choices became progressively more politically charged, we realized that our interests tended more toward social history from ancient to near-modern rather than strictly contemporary topics. Our first meeting was October, 2008 so we're coming up on our second anniversary and the beginning of our third year. Tell us about your members? The core group is 10 strong, with 6 women and 4 men in that contingent; we often have a drop-in or two. Half the group is retired (some of them former history teachers), and the other half ranges between 40 and 60. We don't advertise in any fashion that encourages a specific age group, this is just the way it played out. All the members are interested in history; some are even history buffs But one of the things that makes the group so enjoyable is the diversity of interests and significant knowledge in other fields. We all appreciate that about each other. Although we're not exactly history geeks, we do enjoy the subject. Because history is not a popular cocktail conversation topic, the meetings are a chance for us to socialize with like-minded people, so we're all eager for the meetings. How did you come together? We invited a few friends we thought might be interested in our idea. Not all of them joined, but a few of them are still with us as members of the core group. The Book Works includes information about the group on their website and posts fliers at the store; some of the core members joined us as a result. Very importantly, The Book Works supports us by providing a meeting place. Because the bookstore is centrally located, it's easy for patrons of the store from all over the county to join us. 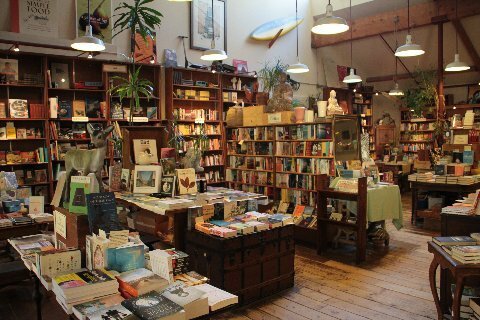 Meeting at the store eliminates hosting duties for the members and brings business to the small, independent book store. Did you have an idea about the way you wanted to approach history? We wanted to explore history without getting bogged down in names and dates, battles and lists of kings, presidents, and empires and discover the stories behind the scenes. At one point, we identified ourselves as Everyman's History Book Group. A good example of that type of history is 1215, The Year of Magna Carta. It details the political and economic conditions that lead to the creation of the Magna Carta, and also gives a look at what it was like for the everyday people who lived at that time. Lesley subscribes to The New York Review of Books, belongs to the History Book of the Month Club, is member of BookBrowse, and does extensive research to find books appropriate to the mission. As we narrow the list a little, Maggie does more research to be sure that we haven't missed anything. Group members also make suggestions from similar sources, including authors whom they're familiar with, or books they've discovered and want to read. We take part of a meeting every so often to make the choices as a group, usually selecting 3 to 4 books at a time for the coming months. We've found that it's best to do this at the beginning of the meeting, rather than at the end when everyone wants to head for home. Tell us about some of the books that have generated the most interesting discussions? We're reading A History of the World in 6 Glasses by Tom Standage for the second time by group popular demand. Standage is a great storyteller. And this book in particular presents a very accessible approach to world history. When we read Rounding the Horn, we invited some sailors as guest speakers to discuss some of the sailing terminology, and they immediately joined the core group. The Man who Loved China, by Simon Winchester, attracted many drop-ins (people who'd been to China, or who had relatives visiting China). Collapse by Jared Diamond, brought in several members of the nonfiction group for that particular meeting. Our discussion about The Victorian Internet, also by Tom Standage, was one of our liveliest, followed closely by Barbarians, by Terry Jones and Alan Ereira, which changed the mind of one of our most well-read members about the Roman Empire's influence on western civilization. Are there any that haven't worked? Very little doesn't work for our group because of our members' broad minds and curiosity. We try to choose books that stay close to our mission statement. Are there any tips that you'd like to pass on to other book clubs? We've found that letting the group choose the books and asking different people to lead the discussions keeps everybody involved and participatory. Show and Tell has been fun sometimes as well. For The History of the World in 6 Glasses we had samples of wheat beer, wine, spirits, coffee, tea and Coke! It was great fun to sample the different glasses as the discussion progressed through world history. We did it again with Salt by Mark Kurlansky, sampling various kinds of salt with and without iodine, raw, processed, sea salt, and kosher salt. When we discover an article in a current magazine, newspaper, or online which relates to the book we're reading, we'll point it out to the group. It could be as simple as a cartoon in the daily paper. This reinforces the relevance of history. Sometimes members suggest supporting books or books on related topics as follow-up for anyone who is hooked on a topic. When we can, we will bring along an author's bio or a related story about the author. We even shared around a DVD one time. Sometimes we are lucky enough to be reading a book when an author is on tour and The Book Works will arrange for a special author visit. It usually brings in quite a crowd. What books are coming up on your reading schedule soon? Certain drinks have done much more than quench our thirst. Six of them have had a surprisingly pervasive influence on the course of history during pivotal epochs, from humankind's adoption of agriculture and the birth of cities to the advent of globalization. This is an original, well-documented vision of world history. In 1609, the ship Sea Venture set sail for the New World. It met a hurricane along the way. Among the passengers was aspiring writer William Strachey, who wrote a vivid account of the trip and struggles for survival on an island set against England's first colonial efforts in America. Shortly thereafter, Strachey learned that William Shakespeare's new play, "The Tempest", bore a striking resemblance to the adventures of the Sea Venture. Could this be yet another instance of alleged "literary collaboration" by Shakespeare? A Brave Vessel is a gripping account of Strachey's exploits and a fascinating investigation into literary process. How two colorful figures - Edward VII and Theodore Roosevelt - assumed leadership of the English-speaking world at the beginning of the twentieth century. Working together, secretly, they turned the alliance structure of the civilized world upside down. For centuries, the Druids have been alternately feared and reviled. No archaeological evidence can be linked conclusively to this ancient priestly caste. Julius Caesar is one of the most reliable sources - did he embellish with bad press to make the Romans look good? Aldhouse-Green, professor of archaeology at Cardiff University and world-renowned expert on Druids, shows the elusive group to be more significant than previously believed. She shows that they were not just priests but also scientists, judges, healers, and power brokers - a highly complex, intellectual, and sophisticated group. They even traveled with and advised the Gallic military. The book addresses issues that remain relevant today: propaganda, theocracy, resistance and colonialism, and clashing ideologies. The story of Sir Sandford Fleming, the man who created, and then convinced all the nations of the world to adopt, a unified standard for telling time. Standard time was one of the crowning achievements of Victorian progressives and one of the few innovations to have survived practically unchanged into our era. The story of a lone genius, John Harrison, who, in the mid-1700s, solved the greatest scientific problem of his time. How to tell precise time at sea had baffled scientists and their patrons for the better part of two centuries, and Harrison's chronometer would save thousands of lives and increase the fortunes of nations. Those are great suggestions for our readers! Thanks so much for joining us to talk about your group. 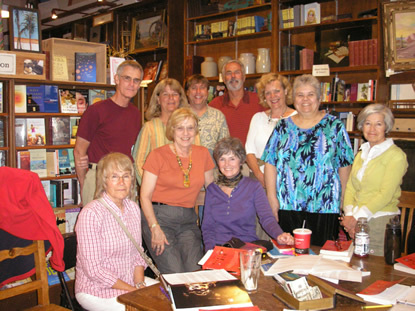 It's always wonderful to meet BookBrowse members. This interview first ran in August 2010. Sadly, The 35-year old Book Works closed in July 2011.